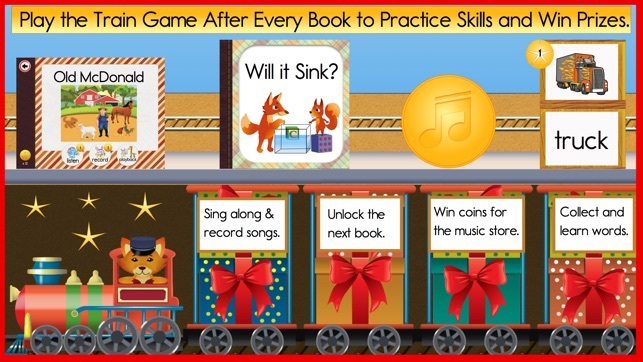 Every child can learn to read with this growing library of engaging beginner books, songs and quizzes. 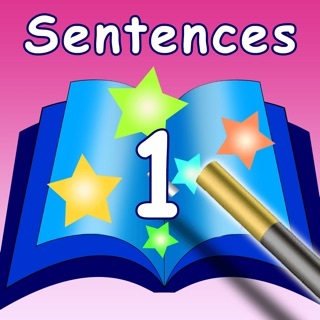 30 books, 20 songs, unlimited quiz games and the 450+ word dictionary are completely FREE. 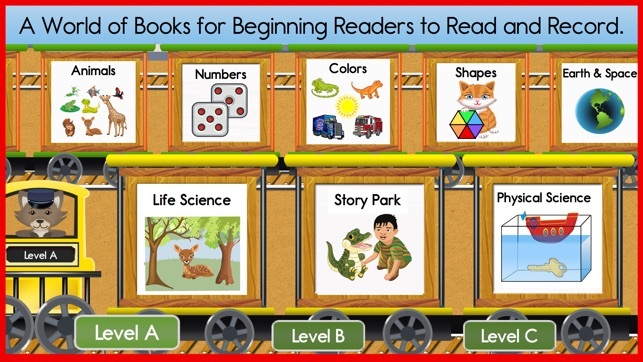 Please note that for schools there is also a complete version of this app called Reading Train Learn to Read Books, Songs & Games including the complete library and all new books, with no in-app purchases. Complete reading curriculum building skills, self confidence, vocabulary and a love of reading. Grand Prize Winner of the 2015 Technology and Reading Award, International Literacy Association. Try 30 books, 20 songs and the 450+ word dictionary for free. Access the whole library of over 250 books with a FREE trial for 30 days when you sign up for an auto-renewing subscription. Choose $1.99/month; 6.99 for 6 months or 9.99 for a year! (U.S. Dollars) All subscriptions are renewing. You may turn off auto-renewal at any time from your iTunes account settings. Safe for Kids: The Learning Station is a Proud Member of Moms With Apps and the Know What's Inside Program. Kid tested and parent/teacher approved. We are ad-free and take our users privacy seriously. Leveled books on numbers, colors, animals, shapes, and science help build the foundational knowledge kids need to succeed in school. 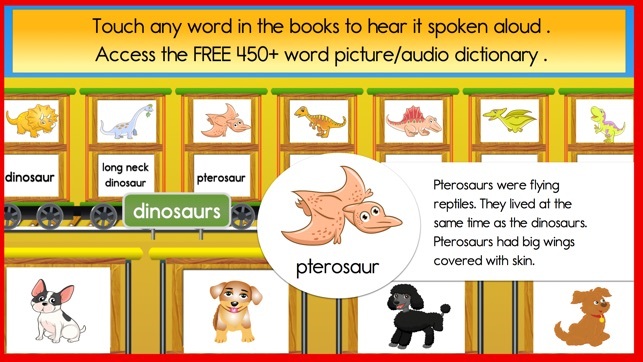 * Free users can read/listen/record the first book in every unit, (30 books in all), play the train game, use the integrated 450+ word dictionary, and listen to 20 song books. * Subscribers get access to all 250+ books, with new books added regularly. * The service can be shared with additional iPads you own. * Your subscription is for your iTunes account and payment will be charged to your iTunes Account at confirmation of purchase (subscribing is optional and in a parent-only section of the app). * You may turn off auto-renewal at any time from your iTunes account settings- Manage Subscriptions. * No refunds for unused portions of the current subscription are allowed during active subscription period. * Not compatible with iPad 1. Lots and lots of new books for subscribers. 6 more titles in the Animal Groups Unit: Learn all about Birds, Animals Without Backbones, Big Animals, Insects, Dinosaurs and more! 9 new titles in the Creature Features Unit: Read about animals with Stripes and Spots, Teeth, Eyes, Necks, Shells, Feet, Horns, Noses and Ears. Each book available at Levels A, B and C, 45 books in all. If you enjoy the Reading Train, please consider leaving us a review. Your feedback helps us to continue to make updates with great new content. Love the new books. I like that kids can read anywhere and anytime even when you are not connected to WiFi. The Reading Train is hands-down the favorite of my 5 to 7 year old students. 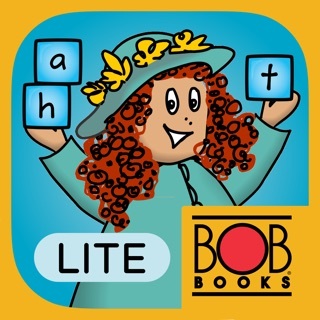 This app has everything they need to develop from pre-readers to self confident, independent readers. Kids can get started right away with reading real books. The books are very simple, fun and informative with lots of interesting topics to choose from. 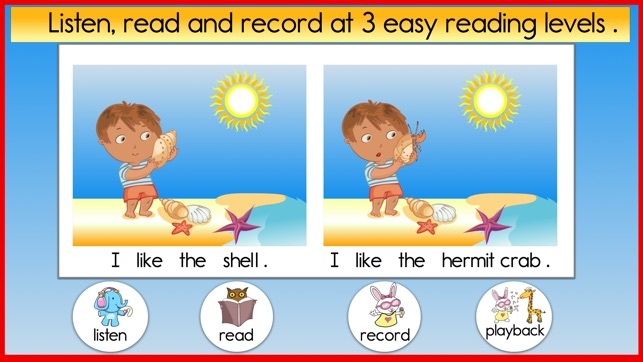 There are 3 beginning reading levels so it is easy to find just right books for every child. Kids love to record themselves reading which is a great way for me to assess their reading progress. Every word can be touched to hear it spoken and I love the built in dictionary where kids can hear and see definitions of hundreds of words and build their background knowledge. 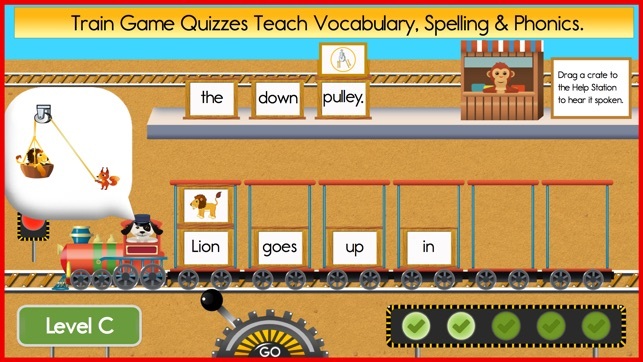 The train game lets kids practice phonics, spelling and even tests comprehension as kids have to pick items for a category related to the book they just read. My kids love earning coins to spend in the music shop where they can sing along with familiar and new children's songs. I subscribed for a year for just 9.99 which is incredible value as I know we will be using this app every day! I have an 11 year old with autism and he has struggled with reading from the beginning. He started the school year at a kindergarten level and by the end of the year he was at a first grade third month. I believe with the help of this app he was able to be so successful. I love how if he does not know a word he can hold his finger on it and then he can hear what the word is. I like the different categories and levels. 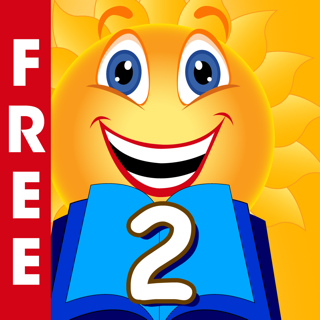 I would suggest this app for struggling readers! 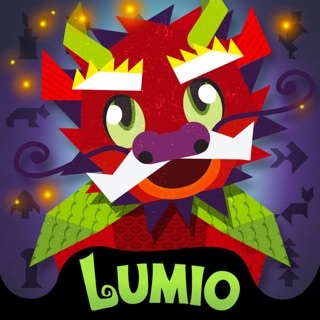 Now if the programmer can create one with the next levels that would be great! Stupid greedy app- can’t even preview it without a subscription. There’s literally one baby book and everything single other book and level requires you to pay. I’m not signing up for an ongoing payment for an app that might be useless. Hello. I am so sorry you found the experience frustrating. We take customer feedback very seriously so have decided to unlock much more free content and offer a 30 day free trial. With any subscription, you can have access to all the books and songs for 30 days without any charge. Our latest update also provides a huge number of free books and songs without the need to sign up for a subscription. The first book in each unit is unlocked, along with all the songs and the 450+ word dictionary. I hope you will consider trying the Reading Train again. Please contact us at support@readingtrain.org if you have other concerns or questions.